Okay, enough of the leaks and whatnot... here's the official announcement of the new LG G7ThinQ phone. It's coming our way on June 1st. The price has yet to be determined, but here's the official release from LG. I'll be posting my thoughts on the sneak peek event I got to attend last week shortly. 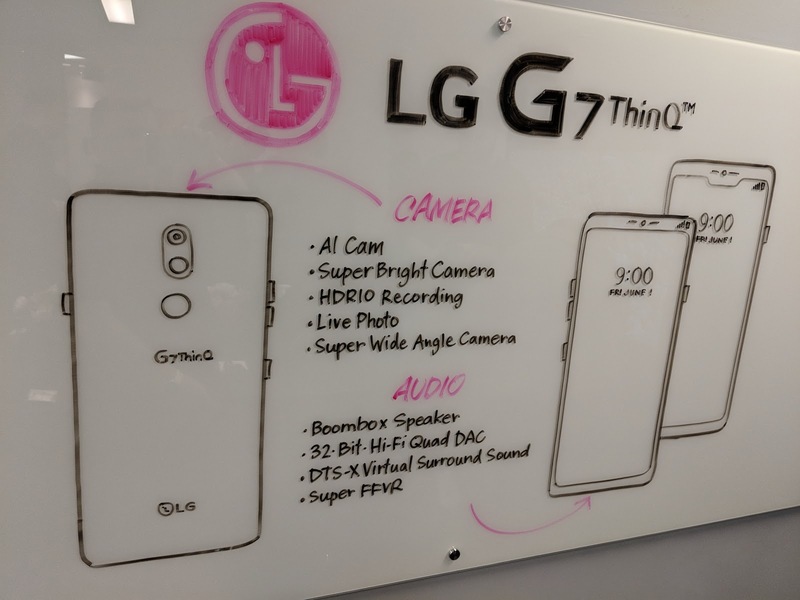 TORONTO, May 2, 2018 — LG Electronics (LG) today introduced its latest premium smartphone, the LG G7ThinQ, focusing on bringing useful and convenient AI features to the fundamental consumer smartphone experience. Powered by the latest Qualcomm® Snapdragon™ 845 Mobile Platform, the LG G7ThinQ offers 4GB of RAM and 64GB of internal storage to run even the most demanding tasks and apps with ease. Equipped with a stunning 6.1-inch bright display nearly half an inch larger than its predecessor but not a hair wider, the LG G7ThinQ is sized perfectly to be used with one hand. Sporting a new design aesthetic for the G series, the polished metal rim gives the LG G7ThinQ a sleeker, more polished look, complemented by Gorilla Glass 5 on both the front and the back for enhanced durability. Again rated IP68 for dust and water resistance, the LG G7ThinQ was designed to meet the requirements of 14 MIL-STD 810G tests designed by the United States military to evaluate the performance of equipment in harsh environments. The LG G7ThinQ has been upgraded with an 8MP camera up front and 16MP lenses on the back in both standard and Super Wide Angle configurations for higher resolution photos with more details. LG’s signature wide angle camera now captures even more beautiful landscapes with less edge distortion and selfies are clearer and look more natural compared with previous LG phones. LG has further enhanced the AI features of the camera that first debuted in the LG V30SThinQ. AI CAM now offers 19 shooting modes, up from eight, for even more intelligence-optimized shots. And users can improve their photos further by choosing among three other effect options if the one recommended by AI CAM doesn’t suit their tastes. Low light photography on the LG G7ThinQ is taken to a whole new level with the new Super Bright Camera with images that are up to four times brighter without the graininess typical of photos shot in dim light. Through the combination of pixel binning and software processing, the AI algorithm adjusts the camera settings automatically when shooting in low light. LG has also added new features that make photography on the LG G7ThinQ even more enjoyable than ever. Live Photo mode records one second before and after the shutter is pressed for snippets of unexpected moments or expressions that would normally be missed. Stickers uses face recognition to generate fun 2D and 3D overlays such as sunglasses and headbands that can be viewed directly on the display. New to the G series, Portrait Mode generates professional looking shots with out-of-focus backgrounds. This bokeh effect can be generated using either the standard or Super Wide Angle lens, giving shutterbugs even more creative options. Located just below the volume is a button that launches the phone’s Google Assistant. Users can also hold down the button to start talking to the Google Assistant. With Super Far Field Voice Recognition (SFFVR) and the smartphone’s highly sensitive microphone, the Google Assistant can recognize voice commands from up to five meters away. SFFVR is able to separate commands from background noise, making the LG G7ThinQ a great alternative to a home AI speaker even when the TV is on. LG customer commands for the Google Assistant have been increased in the LG G7ThinQ so users can get even more stuff done with their voice alone. The first thing customers will notice about the LG G7ThinQ will likely be the new 6.1-inch QHD+ (3120 x 1440) display sporting a 19.5:9 FullVision screen ratio and a bottom bezel which is almost 50 percent slimmer than on the LG G6. Powered by LG’s new LCD technology, Super Bright Display, the LG G7ThinQ can be viewed easily even under direct sunlight with brightness up to an industry-leading 1,000 nit, displaying 100 percent DCI-P3 colour gamut. And depending on the type of content, the display can be set to six different viewing modes: Auto, Eco, Cinema, Sports, Game and Expert. In Auto mode, the phone automatically analyzes the content of games or photos and optimizes and optimizes the display and power consumption. The user can fine tune the image even further by adjusting the screen temperature and RGB levels individually. The smartphone’s New Second Screen gives users flexible options when it comes to setting up the display to fit their tastes and style. The display can be fully expanded for a bezel-less look or it can be set to a more traditional style where the section of the notification bar is completely blacked out. Users can even change the notification bar to another colour for a more personal effect. Continuing LG’s commitment to deliver unrivaled audio experience on its smartphones, the LG G7ThinQ offers premium audio innovations that remains unmatched in the industry. Available for the first time in the LG G7ThinQ, Boombox Speaker utilizes the internal space of the LG G7ThinQ as a resonance chamber to deliver double the bass of conventional smartphones for powerful “boombox” sound without the need for external speakers. When placed on a solid surface or box, the smartphone utilizes its resonance chamber as a woofer to amplify the bass effect even more. The LG G7ThinQ is also the first smartphone to offer DTS:X to deliver virtual 3D sound for all content, up to 7.1 channel audio with earphones. Carrying on the heritage of LG’s focus on great smartphone sound, the LG G7ThinQ is equipped with a Hi-Fi Quad DAC for incredibly rich sound especially when paired with high-impedance earphones. The LG G7ThinQ will roll out in the coming days in South Korea followed by major markets in North America, Europe, Latin America and Asia. In Canada, the LG G7ThinQ will be available at the following carriers and retailers as of June 1st, 2018: Bell, Virgin Mobile, Freedom Mobile, SaskTel, TELUS, WOW! mobile boutique, Fido, Rogers, The Mobile Shop, London Drugs, Walmart, WIRELESSWAVE, Tbooth wireless and Wireless Etc. (Costco Wholesale). Check with your other local retailers for availability dates. Please visit www.LG.ca/G7 to stay updated with device details.